In this episode, Daniel is on a date with someone who really doesn't like spending money. What phrases does he use to move the conversation along? 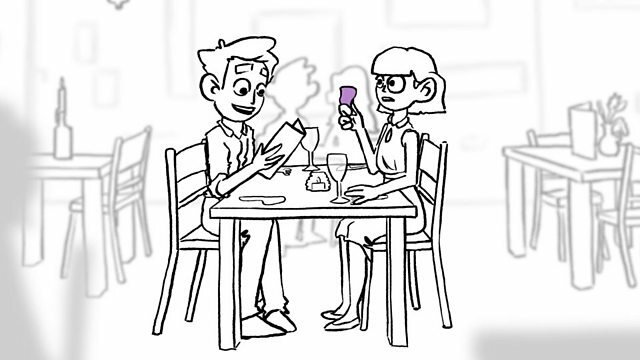 Watch the video to discover some key dating language. How are you doing? I was wondering if you were gonna show up. Oh, sorry. I’m a bit late. I’m only kidding. I’m only kidding. At first, she was about thirty minutes late, which is fine. I can get over that. But she had really nice energy when I first saw her. Right, so I’ve had quite a lot of time to look at the menu. And I was thinking of getting this, the pasta. Doesn’t that look great? Erm… yeah… I have a voucher and I’m not sure that applies? Basically, it’s… it applies to the children’s menu. So you can choose something off that? Oh, it’s just I’m… I’m famished at the moment. I’m really quite hungry. So I was thinking I need quite a big meal. So… maybe if I, I’ll just, don’t worry about the voucher… if you go for something on the children’s menu. If you’re okay with that. So, we’ll both save money. We’re not gonna split it halfway because obviously the pasta will be more. That was… presumptuous of me. No that’s okay, don’t worry. I wouldn’t say it went well. Erm, I think she’s a bit cheap. She kept asking me about how much I earned. There was a lot of squabbling over the menu. So Janet, tell me a little bit about yourself. What do you do? Erm, so I’m a sales assistant. Don’t get paid enough though. It’s terrible. Where do you work? Er, I work in advertising. Oh right. So, you probably get paid quite a lot. I get… it’s an alright wage, but erm… I don't really like talking about money that much. Sure, it’s a bit vulgar, isn’t it? So, she didn’t want to pay a tip. I used to work in hospitality and I wasn’t very comfortable about that. I actually ended up paying for the whole meal, which I think was a little bit unfair. Sorry, can I just remind you we’re not splitting it. I’m paying with… a voucher. The voucher, sorry… the voucher. Oh, for the… for the waiter. Oh yeah, but they were so nice. Yeah, but I don’t have to pay them tip. I didn’t ask them to be nice. I know you don’t have to. I used to work in hospitality… trust me… they don’t get paid anything. This is, this is how they… make their living. Well, then they should have chosen another career. Okay. I tell you what, I’ll pay your tip. It’s fine. Okay, I mean if you feel that strongly about it then… that’s fine. Erm, can I just check you’re also paying for the wine and the garlic bread cos I didn’t order that. You did have quite a lot of the wine. Ah, if she pays for the meal. No, probably not. I was wondering if you were gonna show up. I’ve had quite a lot of time to look at the menu. If you’re okay with that. I don’t really like talking about money. I tell you what, I’ll pay your tip. Daniel said this when he wanted to order a pasta. Which of the following did Daniel say to suggest an idea? Daniel said this right at the end. Which of the following did Daniel say to offer a solution? Daniel said this and he and Janet discussed each other's jobs. Which of the following did Daniel say to find out more about Janet? Join us in Session 20 to see Daniel go on another date in search of love!